The German folk dancing group will meet on March 25th, at 7:30 p.m. It is a “fun” group that teaches basic folk dancing appropriate to Teutonia. As in previous months the $5.00 per person entry fee will benefit the club. Everyone is welcome! Bring a guest and join the fun. See details on the folk dancing page. For more information call Jackie Dorfner @ 412-257-7574 or email to dorfner24@comcast.net. New members must arrive before 7 PM or earlier if they are eating. The meeting is held upstairs in the Sängerhalle and begins at 7:30. Formal or Traditional Dress is Required. Celebrate the 55th anniversary of the Alpen Schuhplattlers with the Youngstown Saxon Brass Band as our musical guests. Tickets are just $12 for adults and $6 for children12 and under. Please contact Marina Ruggiero or call 412-491-0577. Dinner is available for a separate charge. Join the Alpen Schuhplattlers! 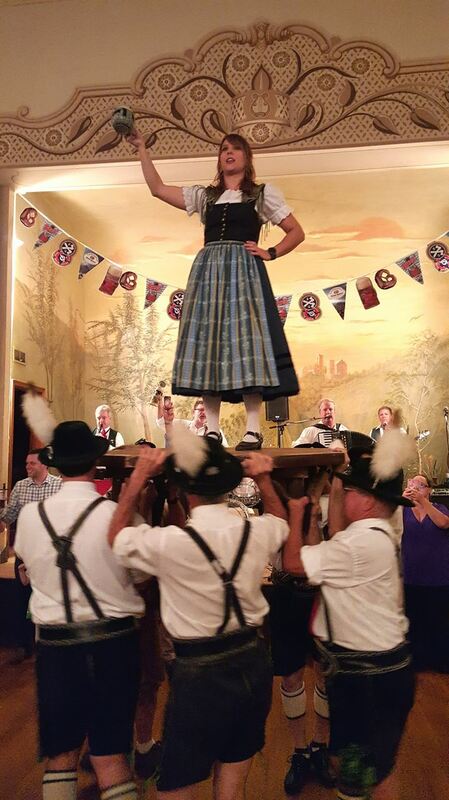 The Alpen Schuhplattlers are a fun, family-friendly way to explore your German heritage! New members are always welcome. No dance experience? No problem – we’ll teach you! Practices start at 7:00pm on Tuesday nights at the Teutonia Männerchor. Stop by and visit us or contact Marina at 412-491 -0577/. Admission is OPEN TO THE PUBLIC. There will be 100% ID Check at the gate. The entrance fee will be $5.00 per person for one day, which includes a beer mug! Entrance for those under 18 is free. Here is a tentative line-up for the 2 day celebration! 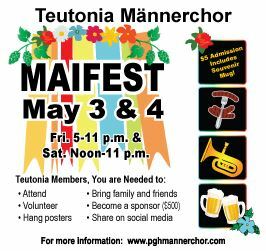 This proves to be one of the biggest fests at Teutonia and we look forward to seeing all of our members (and their guests) at this once a year event! Typical German food and beverage (and of course BEER) will be available at fest prices during the fest at specially erected food stalls throughout the fest grounds! There will be other vendors as well, so come and explore Maifest! Parking is, as you know, limited, so please park on both sides of Phineas Street (including towards Penn Brewery) as well as back on Peralta and Suismon streets, paying attention to any regulations. There will be tours of the club given for the public at specific intervals. Take this opportunity to learn more about your club (or introduce your friends to Teutonia)! May is fast approaching! Make plans with your family and friends to attend! For Life members, their guests, and members of the Board. Dinner will be served in the Sängerhalle starting at 4:00pm with a social hour and a selection of songs by the Teutonia Choir. Please make your reservations indicating your choice of Prime Rib or Stuffed Flounder dinner. New Life Members get their dinner free of charge, current Life Members are $12.00 and all guests, $20.00. Looking for an evening of fun and games? Come to the Teutonia’s new monthly board game night, or Spiele Abend! Board gaming is growing in popularity in Germany and the United States. Germany is a hotbed of modern board game design and hosts the world’s largest board gaming convention in Essen. You may have seen German board games like Catan, Carcasonne, and Ticket to Ride in stores. These unique games challenge your luck and your skill; more important, they’re a lot of fun! Hosts Jim Viel and Nancy Ott will bring their board games and teach you the rules. All you need to do is play! All members and their guests are welcome. We’ll meet on the second Thursday of each month. For more information, contact Jim Viel at viel@verizon.net. The annual flower planting will take place on Saturday, May11th, starting at 8:00am. Bring your boots, gloves, rakes and shovels – and help keep Teutonia beautiful. Lunch (cold cut platter) will be provided. The flowers are being provided by the Western PA Conservancy. If the flower box geraniums arrive in time, we will plant those as well. Deutschtown Musicfest (a sponsored event) Friday July 12th and Saturday July 13th we are participating in Pittsburgh’s best music fest. Music in our Biergarten, details to follow. Oktoberfest Friday and Saturday September 6 and 7 – Friday 5PM till 11PM and Saturday Noon to 11 PM With the big tent, food and bands.